Þ Ensured the provision of 1,500 bottles of cold water each day. Hotels: Approximately 400 of the conference participants were housed in three inexpensive hotels (the Knight’s Palace, the Gloria, and the New Imperial hotels), all in proximity to each other in the Christian Quarter of the Old City of Jerusalem. Participants were assigned roommates at their request, but countries were mixed among all three hotels. 2-3 staff members from the Organizing Committee were also accommodated at each hotel in order to handle registration and answer any questions. Buses: Each morning and late afternoon, a fleet of 8 buses moved women between the hotels and the conference venue. Because of the narrow streets in the Old City, women had a 10-15 minute walk to reach the buses outside the walls. Transport caused unfortunate delays in conference time, but these delays were anticipated and scheduled into the program. We also made extensive use of buses for travel to Ramallah, Bil’in, the Separation Wall, and Kalandia. Meals: Ordinarily, this would not merit discussion, except for the following. Lunches were catered by two women’s collectives – the Palestinian “Bint al-Balad” and the Israeli “Women Cook up a Business”. Breakfast was served at each hotel, but all participants (even those not staying at the hotels) gathered for dinner every evening at two of the hotels. All meals were vegetarian. Languages: To ensure the participation of women from different backgrounds, all plenary sessions were simultaneously translated into 6 languages – Hebrew, Arabic, English, Spanish, Italian, and French. We also tried to arrange in advance for volunteer translators in some workshops, but others were unilingual. Most, but not all, official conference materials were translated into all six languages. Visas: The Israeli authorities are strict about entry into the country, particularly with respect to citizens of developing countries. After deliberating the issue at length, the Organizing Committee decided to declare openly to the Interior Ministry that we are inviting women to a Women in Black conference, and to demand our right to hold this conference openly and bring in women to participate. We published and hung a poster advertising the conference throughout Israel saying “Women Resist Occupation and War” (photo). After many initial negotiations at the Visa Department, and pressure from two Knesset Members, we were successful: Every visa that we sought was granted. Activists refused entry: About two weeks before the conference, three participants who did not require visas – two from Spain and one from Iceland – were turned away at the borders, based on their record of human rights activism in the territories (on previous visits). The Organizing Committee immediately hired a lawyer with experience in this work, and trained a task force of 8 women (two in each language of English, French, Spanish, and Italian). When participants were detained at the airport, they called someone on the task force who spoke their language and gathered the relevant information from them. Our lawyer then began to advocate for their release, using persuasion with the border authorities and pressure from government officials. As a result, although women with rich records of activism were detained for up to 8 hours and threatened with being turned away, every one was ultimately allowed to enter the country. Plane tickets to Africa: During the course of inviting women from distant countries, we learned that electronic plane tickets (e-tickets) cannot be issued to many third world countries. This was complicated by the fact that there is no Israeli consulate in their countries to issue the visa that was approved in Jerusalem. An additional problem was the need to acquire visas for stopover countries. We realized that we did not leave enough time to make all these arrangements, and as a result, there were invited guests from Burundi, Rwanda, and Kenya who could not attend. There is no Women in Black movement in the Palestinian territories, but the Israeli women organizers regarded the participation of Palestinian women in the conference as a matter of principle and did everything possible to maximize their involvement. There were two levels of obstacles: (a) the difficulties of meeting with each other for planning, as a result of the restrictions on movement; and (b) the difficulties of maintaining relationships in a situation of national conflict and power imbalance. A group of about 12 Palestinian women joined the Organizing Committee on the Palestinian side, while approximately 30 Israeli women participated in the organizing on the Israeli side. Joint meetings were always small – 3-4 women on each side. The first joint meetings were in Ramallah, later joint meetings were held in Jerusalem. It was agreed that the overall conference program would be planned together, while the political action inside Palestine would be planned exclusively by the Palestinian side. Palestinian women were visible at the conference, both in the audience and on stage. We also know of Palestinians who took risks to attend the conference, crossing the borders illegally. Lesbian workshop: After both sides initially approved the program and it was circulated internationally, the Palestinians insisted that the workshop “Lesbian Activism against Oppression” be deleted from the program. The Palestinian organizers said that this workshop would have been acceptable to them, but it was intolerable in their society and would put them at serious risk. Although this met with strong opposition on the Israeli side, the Palestinians did not relent, and the workshop was removed. The removal of this workshop became the subject of much discussion throughout the conference, and the inspiration for t-shirts that were printed in Arabic saying “Lesbians for a free Palestine”, which many wore throughout the conference. Women from the “Arab world” disinvited: Pakistani, Egyptian, and Iraqi women were planning to attend the conference (the Pakistani and Iraqi women held UK passports, enabling them to enter Israel). When the Palestinian women on the Organizing Committee learned of this, they wrote a letter to them stating, "As we appreciate your initiative to participate, but since the conference is taking place in East Jerusalem, Palestine, we as the Palestinian coordinating group refuse to be a bridge for normalization between the Arab World and Israel. We hope you reconsider your intention to participate." None of the three attended and the issue caused great distress on the Israeli side, most of whom disagreed with the Palestinian position on this matter. Ramallah visit: Another source of disagreement was the fact that the Israeli conference participants were asked not to attend the meetings in Ramallah, although many wanted to attend. Furthermore, and in retrospect, the Israelis also would have wanted more input about the program in Ramallah, as many were opposed to the idea of a visit to Arafat’s grave. 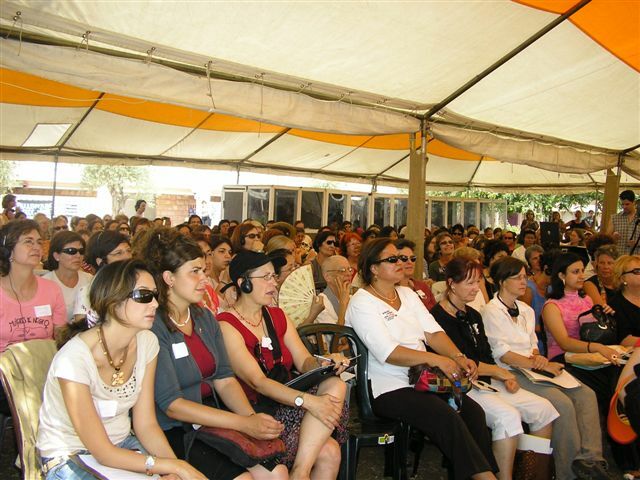 International Women in Black Conference, Jerusalem, August 2005.